Be it a special birthday or anniversary, a hen or stag party, every large gathering is made more special when spent in beautiful surroundings with your closet friends and family. Here are some few holiday homes which makes your holiday really enjoyable. A cottage break is the perfect accommodation for discovering everything that makes UK great. Whether you’re looking for a cosy romantic retreat, a fun filled getaway or somewhere large, lavish and luxurious; you’ll find a fantastic selection of properties to choose. Discover the rural hotels deep in the countryside far away from the hustle and bustle of everyday life where you can truly kick back, relax and soak up the stunning scenery and enjoy being close to nature or wildlife. Supernova, Isle of Skye Scotland UK: for a romantic getaway or unique solo break, this luxury self-catering chapel conversion on the Isle of Skye in the Scottish highlands is the perfect sanctuary. Relax in the spa bath and enjoy views over Lochj Harport after a day on the mountain. Supernova lets you experience island life in the lap of luxury .Enjoy breath taking panoramas over the glistening loch and snow-capped mountains beyond. Skye enjoys some of the darkest skies in Europe. Stargazing through the telescope in the living room will make you feel as if you are on the edge of the world. 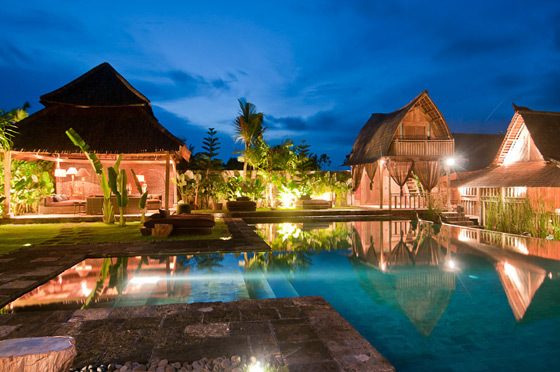 Villa asli, canggu, Bali: This villa is located in canggu, Bali. The villa is a 2 minute walk from Kayu Putih Beach. It takes five minutes to reach the villa from la laguna and la finca. The villa is located 45 minutes away from Bali’s international airport. Villa asli has an open plan living areas that overlook the large swimming pools and lush gardens. There are five different bedrooms that are housed in a standalone pavilion, which are connected through wooden walkways that are over the lily ponds. The living areas are featured with a variety of antique pieces and arts. The dining area is just situated near the living area; it is also in an open pavilion. The dining table is made purely out of wood and it has chairs that can be used for 14 guests. It also has a fully furnished kitchen with seating arrangements available on bar stools. There is a bar that is adjoined with the media room which has three T.V sets. This villa offers a 25 meter swimming pool that exactly in front of the room also the room offers verandas that gives the scenic beauty of the beautiful lotus and fish ponds. Katathani Phuket beach resort, Phuket, Thailand: It is located on the southwest coast of Phuket. It takes less than an hour to go to this place from the Phuket international airport. The resort has six restaurants and five bars. The resort has a combination of beachside and garden space. It offers six swimming pools, six restaurants and a full service spa. It also has two separate wings. Along with pools it has huge grounds as well as an adjacent 850 metre long beach. These things are never too crowded. A South African Holiday home nationwide makes sure you get the best holiday accommodation available for your preferred holiday destination in South Africa. Self-catering accommodation for you and your family is waiting. Come and soak up the sun, sea and view on our South African coastal areas such as Kwa Zulu natal, The Garden route, Eastern Cape, Western Cape, and the West coast regions. Durham: Old farm cottages are ideal for a romantic break in with a private garden and hot tub. Couples can enjoy quiet and seclusion on the private patio, enjoy uninterrupted country views. Belle Vue: This beautiful cottage is nestled in the picturesque village of Eggleston on the outskirt of the stunning North Pennine hills. There are also plenty of attractions within a close radius, which includes the historic town of Bernard Castle and the Bowes Museum with lovely walks along the banks of the river Tees to the old abbey. There are also boutique in cobbled streets, the Victorian markets, restaurants and galleries. So if you are looking for a peaceful stay, then go out for a holiday where you can re-charge yourself amongst beautiful countryside.